Popurls.com looks to provide a simple, clean interface for a portal to the “most popular” urls from the hotest sites out there as soon as they break. 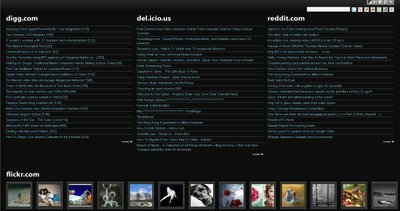 The interface is simple, laid out in columns for each of the sites, and full-width areas for the two more graphical of the sites included - flickr.com and youtube.com. For the sites that provide more detail in their feeds than just the title of the post, they make use of the moo.fx library’s effects to slide out the extra content when the mouse is over the topic’s title. The site also refreshes to go out and fetch the latest headlines from each source and updates the page to reflect the updates pulled from the feeds. There’s also the option (on the text feeds) to view “More” of the entries for each list, just in case you missed some.